Last weekend, two students from Leeds travelled to Dundee for the first time to enjoy an accessible city break. 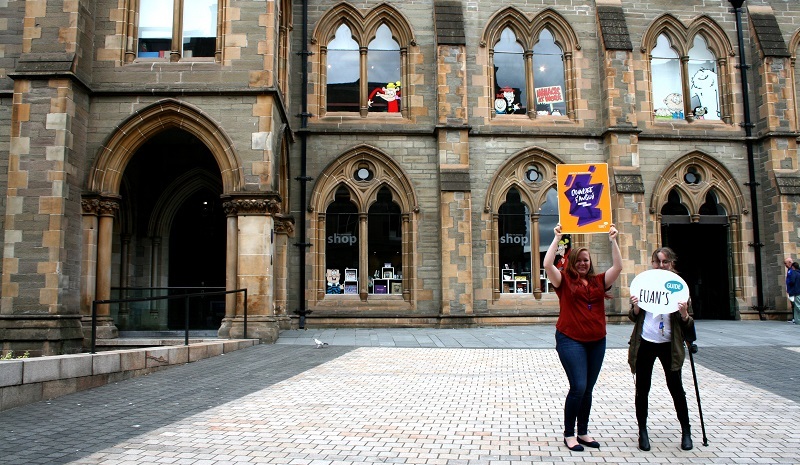 We asked Hannah and Becca, who are studying a master’s degree in Disability Studies at the University of Leeds, to write about their fun weekend trip from northern England to Dundee and all the things they noticed about disabled access along the way! 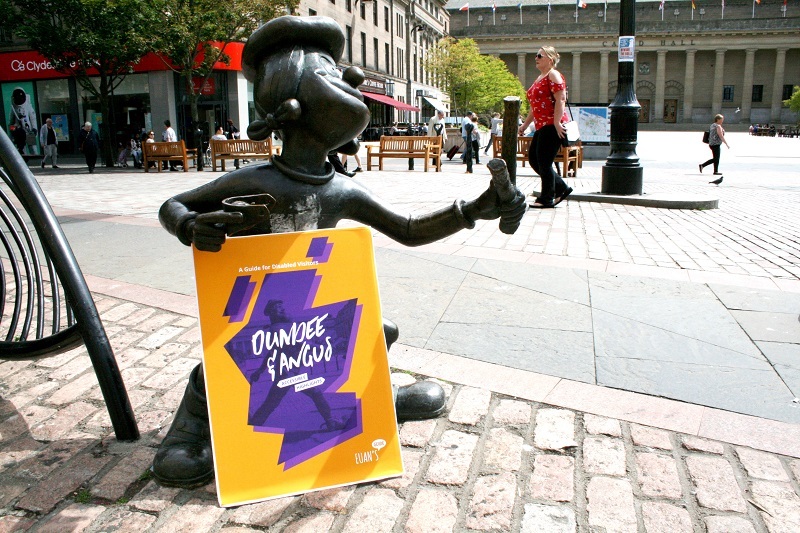 Photo: Minnie the Minx got away with the Dundee guide! The trip from Yorkshire to Scotland was a lot easier than we expected – we booked our train tickets through the Trainline app and got a good deal on an open return, which meant that we had more flexibility in choosing our trains on the day. We also had a Disabled Person’s Railcard which made it a lot cheaper! It was a quick train up to Edinburgh with beautiful scenery and we were sat in the more accessible seats near the luggage racks which meant we had lots of leg room. When we got to Edinburgh we had plenty of time to get through the station and find the platform for our next train up to Dundee. The train station is stunning with lots of shops and cafes, as well as an accessible toilet (which you need a radar key to access). There are plenty of lifts and friendly railway staff on hand to help if you’re looking a bit lost or need any assistance. We were booked into the Premier Inn near to the station and we were pleasantly surprised by how close it was to the train station – just over the road and it took us about five minutes walking. The pavement and space around the train station is all level access and there were plenty of dropped curbs on the way to the hotel. Check in was very easy and we chose to use one of the machines which even printed out our room key cards for us. The room itself was very spacious, with lots of grab rails in the bathroom, and an alarm for emergencies beside the bed. It was nicely decorated too! Staff were very friendly and helpful. On our last day they even had a ticketing system to store our luggage. The location was perfect, right beside the River Tay and just across the road from the station, and Discovery Point! Photo: A Maggie’s Penguin, RRS Discovery and the V&A Dundee. It’s clear to see why Dundee has been included as one of the top ten European destinations by Lonely Planet and it was amazing to visit such an accessible place. One of the most striking things is how flat it all was, and where there were raised pavements there were also dropped curbs, and tactile paving at all the traffic lights. There were rails whenever there were stairs, but also step free access, and an abundance of benches and places to sit down dotted around the city. The Euan’s Guide for Dundee and Angus is a great place to start if you aren’t sure what attractions you want to explore, but unfortunately, we ran out of time and didn’t get to see them all, which means we’re planning a return visit! On our first day we visited Dundee Contemporary Arts (page 5 in the Dundee and Angus Guide) which was hosting the first major European exhibition of American artist Eve Fowler, with no admission charges. We also bought cheap tickets to see the new Incredibles 2 film in their downstairs cinema (accessible via a lift), but as we had a bit of time to spare we went across the road to explore the Dundee Science Centre. One of the highlights of our trip was their ‘Music Mayhem’ section, where their immersive interactive exhibition had a wide range of oversized and creative musical instruments, as well as explaining the science behind music in a fun and accessible way. Photo: Hannah and Becca at The McManus. On our second day we decided to walk around to find all of Dundee’s playful statues (find out more about them on page 6 of the guide), and managed to take pictures with Desperate Dan, ‘Dawg’ and Minnie the Minx, as well as Oor Wullie, the five little bronze penguin statues outside Steeple Church, and the copper Dragon Statue on the high street. 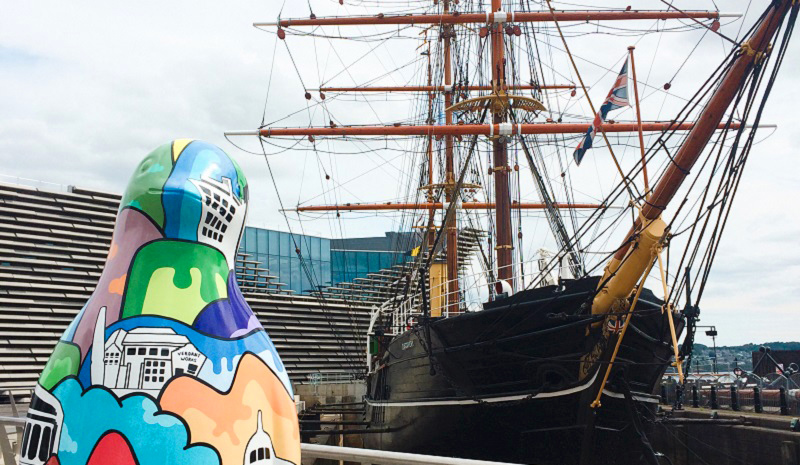 As well as looking for Dundee’s permanent statues, we were lucky enough to visit during Maggie’s Penguin Parade, making Dundee home to a trail of individually designed and beautifully decorated giant penguin sculptures. We only managed to find 19 of them, but had an amazing time exploring the city and learning more about its history and culture through the local artistic talent. We also wandered around the waterfront and had a great time walking through the different themed gardens, which again impressed us with the thought put into them and the accessibility. Whilst exploring, we made our way over to Verdant Works to find out more of the vibrant history of Dundee and the stories of those who lived here. Becca had a lovely conversation with Lily, who used to work as a finisher from leaving school, and now is a machine operator in the museum to show people how the different machines work (it was very loud!) You can buy a combined ticket to also go and visit Discovery Point (page 10) on the waterfront and learn all about how Dundee was a hub for building the ships used for exploring the Antarctic as well as some of the crew who went on these amazing journeys. One of the highlights here was that although the RRS Discovery ship is inaccessible, they had a video tour of the inside for anyone who couldn’t climb onboard. 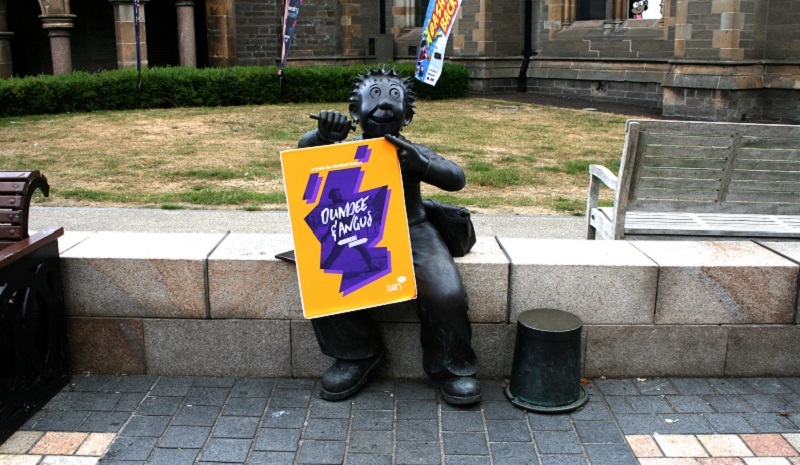 Photo: Oor Wullie and the Dundee & Angus guide! Finally, we headed over to look at The McManus: Dundee’s Art Gallery and Museum (page 6), where they had an exhibition on all about Bash Street to celebrate the 80th birthday of Beano. They also had numerous art galleries with some stunning paintings and other artwork. Both nights we had dinner out and were spoilt for choice, with a wide range of cuisines just minutes away from our hotel. The first night we went to Dr.Noodles on Nethergate (they’re also available on Deliveroo). We think they were accessible as there was a disabled toilet, however, they could have done with a sign to point out that they probably have a ramp for their front step. It was a make-your-own style, where you chose a base, sauce, and protein (including tofu) that the person serving then made fresh. The atmosphere was very nice and relaxed. The second night we went to Tony Macaroni (the name grabbed our attention), an Italian on Whitehall Crescent. It is completely step free, with a decent sized disabled bathroom, and the restaurant itself is beautifully decorated in modern décor. They also did mains on a Sunday for £6.95- so it’s also great value!